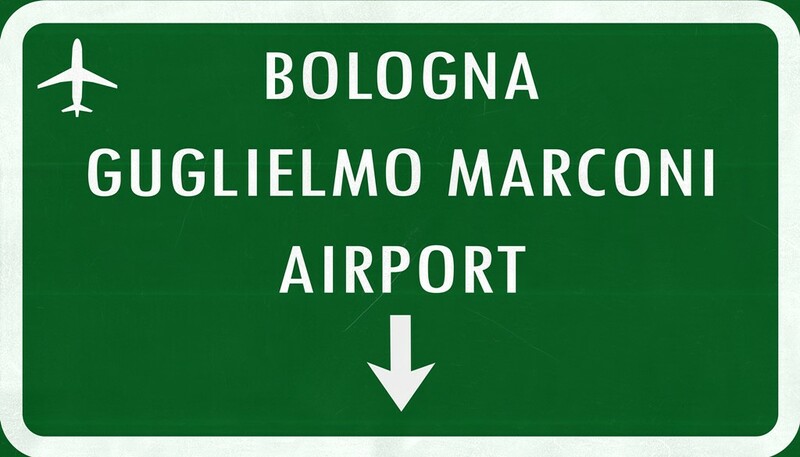 Bologna airport, also known as Guglielmo Marconi Airport (BLQ), is situated 6 km northwest of the city centre and 200 km southeast of Milan. 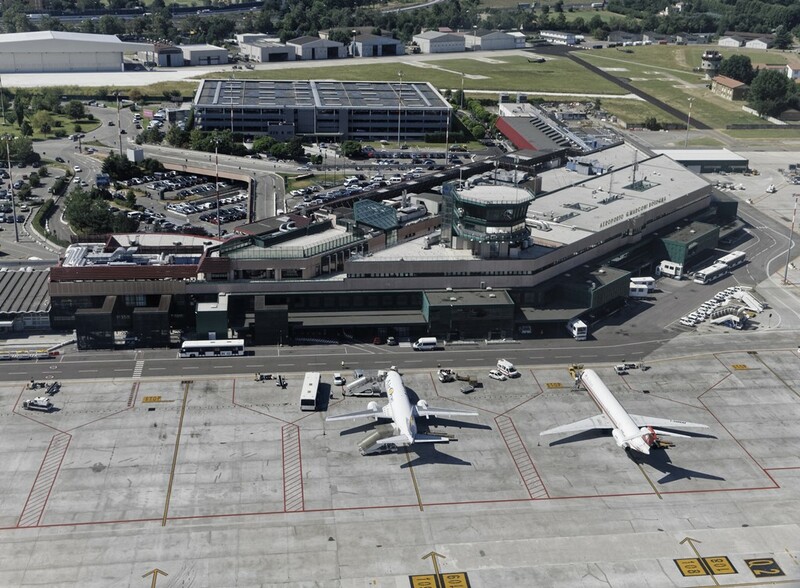 Counting about 7 000 000 passengers in 2015, it is the 7th busiest Italian airport. Their official website provides a guide for travelling passengers upon their arrival or departure. Travelling to and from the airport is easy, but there is only one bus to choose from. You can board at the Central Railway Station (Stazione Centrale). Aerobus: a shuttle service run by TPER runs every 11 minutes every day of the year connecting the airport with the city centre and railway station in about 25-30 minutes. The first trip from the airport is at 5:30 a.m. and the last trip is at 12:15 a.m. The first trip from the railway station is at 5:00 and the last at 11:35 p.m. You can recognize the bus by its grey and light blue colour, unlike the regular orange city buses. Tickets can be purchased online here, from the vending machines in the airport, and in Bologna at the Central Railway Station or at the TPER ticket offices. One-way ticket from/to the Airport € 6.00. The ticket can be used for all public transport in Bologna 75 minutes from the purchase time, validating it each time on board. When traveling to the city centre, passengers are allowed to disembark at the ‘’Pontelungo’’ and ‘’Ospedale Maggiore’’ stops. It is not allowed to board on these stops. When traveling to the airport, passengers may board at these stops, but not disembark. To get to the city centre, you should disembark at the third stop, ‘’Via dei Mille’’. Reduced service is available on some public holidays like e.g the 24th, 25th and 31şt of December and on the 1st of January. Here you can find the aerobus timetable. Buses are equipped for the transport of people with disabilities. Children below 1 m of height are free of charge. Transfer: In case you have a lot of baggages and wish to book a cheap door-to-door transfer, you can do it online both from and to the airport. Transfers can be booked for any number of persons. From a price perspective private transfer is fairly expensive if you are only a few people, but depending on where you are going to it could be the cheapest solution if you are more people travelling together. When you book a private transfer, the driver will usually await you in the arrival hall with a name sign. Taxi services: There are several taxi companies offering a transport from city centre to the airport. Weekday fare is about 15,00 € + 0,50 € extra per baggage item, while during the holidays the price is 18,00 € + baggage costs. From the 5th person onboard, the cost of 1,00 € per person will apply. NOTE: the prices may vary due to traffic conditions. Renting a car at Bologna airport: there are 11 rent-a-car companies available at the Bologna airport, all located at P3: Avis, Autovia, Budget, Hertz, Goldcar, Locauto Rent, Europcar, Maggiore, Noleggiare, Sicily by Car and Sixt. Here you can compare prices and book in advance to avoid the possibility of overbooking or long waiting due to the crowd. Renting a bus at Bologna airport: In case you are arriving with a large group of people or find some people you want to share your transfer with, you might consider renting a bus prior to your arrival. Buses are offered by several bus rental companies in the area. Bus and train connections: Bologna is served by many public bus lines and ‘’navette’’ (small buses). By them you can visit some out of town destinations like Imola, San Lazzaro and San Luca. The price is 1,30 € per ticket valid for 1 hour, 5,00 € for a day ticket and 12,00 € for 10 tickets valid for 75 minutes. From the Bologna bus terminal you have departures to many italian cities like e.g. Florence, Rome or Venice just to mention a few. Also from the bus station you departures to many international destinations. As alternative to the bus you can also take the train, connections from Bologna you can check here. Bologna is very bicycle friendly so you can rent a bike at low cost in case you prefer some activity over driving around. From BLQ to Florence: There are up to 10 daily departures on the route from Bologna airport to Florence. It takes 1h 25min to reach Florence and one single ticket costs approximately 20€. From BLQ to Rimini: The service called Shuttle Rimini Bologna Airport offers a direct connection on the route. One adult ticket costs approximately 20€ online (25€ if purchased on board). The service also offers connections to Rimini Riviera, Bellaria Igea Marina, Cesenatico, Cattolica and San Marino. A: No, there is a night bus departing from the airport every 11 minutes until 12:15 a.m. and transfers and taxis run 24/7. A: Yes, there is a Hotel Bologna Airport (****), situated 3.5 km from the airport, the hotel has a shuttle service to the airport. Q: I would like to spend one day in Bologna in between flights. Is that possible? A: Yes, of course. The best way would be to take the airport shuttle bus to reach the city center. Buses go every 11 minutes and you will reach the city centre in less than half an hour. In case you want to leave your luggage somewhere while exploring the city and you don’t have a hotel, you can do it on the airport. Located at the first floor of the main terminal, inside Security Staff Entrance a Luggage storage is also available 24/7. The price is 6,00 € per item per day, and for luggage or objects out of gauge the service costs 12,00 € per day. Q: I am continuing my journey outside Bologna. Are there any direct lines from the airport to other cities? A: Yes, there are schedule Shuttle bus lines that connect Bologna to the cities nearby, such as Ravenna, Florence, Ferrara, Modena and Rimini. Unfortunately the information about departure time and exact departure location is a bit hard to figure (Webpages with information partly only available in Italian) but a at least you have and overview of the connection options here. A: Yes, there are several exchange offices and ATMs at the airport, working 24/7, but it would be better to exchange the money before the trip and have some euros on you since the rate will be a lot higher on the spot.